Hildegard – or Hilly as we came to know her – took us on the cable car up the Wallberg Mountain. A 15 minute drive from her wheel friendly accommodation, the Concordia. (nb this route is not fully barrier free). Each cable car is big enough for only two people. So I had to shuffle out of my manual wheelchair for the ride…..and wheelchair came up in the next car. At the top of the mountain there is a flight of about 15 steps which I was carried up. It struck me that it would be possible to fit a stairlift which would, of course, make an amazing difference. Let’s hope that one day they do. However this little hiccup did not detract from THE most amazing experience. 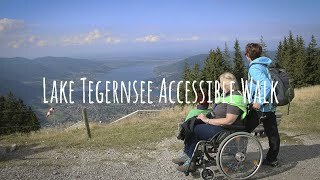 The cable car ride takes about 20 minutes and affords magnificent views of the Tegernsee Valley and its beautiful lake and across to the foothills of the Bavarian mountains. The car stops at the viewing platform 1700m up. From there the views over the German and Austrian Alps are truly breath-taking. You can buy food or drinks at the restaurant or simply take a seat and savour the scenery. On the day we were there that included hang gliders swooping down from places that normally only eagles dare…. There is also a small chapel but sadly it is definitely not accessible in a wheelchair. Notwithstanding that I loved being there. On a positive note there are more accessible cable cars in the area as we were to discover the following day. In the foothills below Wallberg is a cheese factory – Naturkaserei TegernseerLand – and a coffee shop. The whole site is wheelchair accessible with a lift to the toilets on the lower floor. The toilets are also accessible. Visitors can see the cheese making process and sample different cheeses. The unique flavours are down to the hay-rich milk supplied by 22 local farmers. There are no additives or preservatives. We refuelled by trying out a cheeseboard with freshly baked bread and home-made butter. Well it would have been rude not to. It was a lovely interlude made more charming by the jingling of distant cowbells. Everything I imagined a Bavarian mountain setting to be. Now it was time to walk off that snack with a gentle stroll to Lake Tegernsee itself. We crossed the road from the cheese factory and followed the River Weissach. The water was so clear you could see every stone on the river bed. We even passed an otters dam, the first time I have seen one outside a zoo! Eventually we reached the town of Egern. To say it is picturesque is an understatement. It is situated on the lakeside. The spire of the catholic parish church fills the skyline. It is worth the short detour for a walk around the church grounds. They are beautiful. We could have taken a boat back to Bad Wiessee. They are all wheelchair accessible. But on this occasion we chose to drive back around the lake. All of this set us up for dinner. We ate in The Hotel Gastohof zur Post. Everything was good – the food, the wine, the atmosphere – and the company. The hotel is wheelchair friendly which added greatly to the feel good factor of the day. We returned to the Concordia well fed, very tired and very impressed with our whole experience of Bad Wiessee. It was time to sleep, ready for our next adventure.